Lateral ankle sprains are one of the most common sporting injuries especially with sports such as basketball. They can result in injuries to the lateral ligaments, damage to the cartilage in the ankle joint itself (osteochondral injuries), and sometimes damage to the surrounding tendons such as the peroneal tendons. In most cases ankle sprains can be treated conservatively with a short period of immobilization in a walker boot followed by physiotherapy. 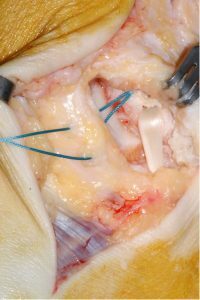 In cases where there is gross instability, osteochondral damage and tendon damage sometimes early surgery is advocated. Late complications such as impingement and instability may also warrant surgery. The increasing use of MRI scans allows us to accurately diagnose ankle sprains and tailor treatment accordingly. Here at the A2F clinic we can access urgent MRI scans usually within 24-48 hours of a request allowing quick and definitive treatment. We offer all types of surgical treatment from ankle arthroscopy to open reconstructions and cater for all levels of athlete from Premiership footballers and rugby players to keen amateur athletes. Treatment of ankle instability in most instances is functional and the majority of patients make an excellent recovery. Persistent instability leading to recurrent sprains and chondral injuries are the two most common causes for persistent symptoms. Persistent instability can be treated surgically in most instances by an anatomic repair of the ligaments. The management of chondral injuries is more difficult. Debridement, drilling and osteochondral autografts have all been described. 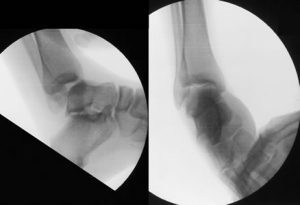 Ankle stabilization procedures can be broadly divided into anatomic and non-anatomic. Anatomic stabilization procedures try to repair the existing ligaments. When these are severely damaged it may be necessary to perform a non-anatomic repair using a tendon transfer. Sometimes it is possible to combine both as in the illustration. The suture repairs the existing ligaments whilst the tendon transfer re-inforces them.